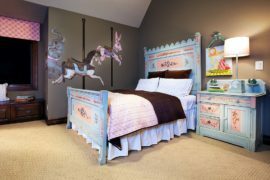 As a style, shabby chic has definitely made a grand comeback in the last few seasons, with homeowners moving away from the sterile and showing a tendency to shop for décor rich in texture, diversity and uniqueness. Couple this with a growing desire to upcycle and embrace DIY projects, and one can instantly understand why the style is spreading so quickly across the globe. 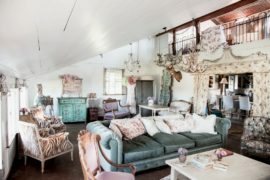 Shabby chic is all about comfort, personality, elegance and embracing of the imperfect! 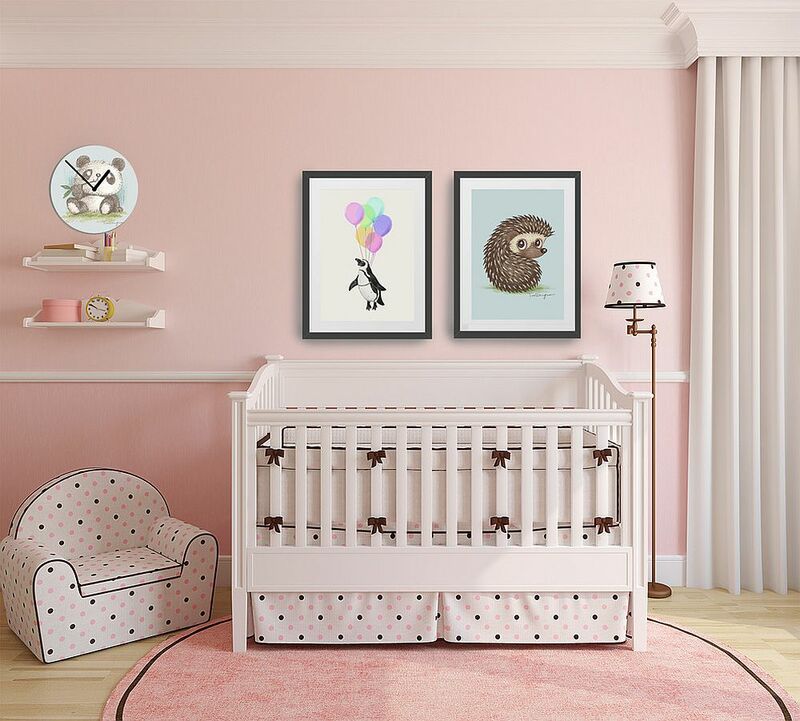 And what better way to introduce your little one to the world of design than by giving her nursery a distinct shabby chic style spruced up by a splash of pink! Shabby chic as a style is definitely a touch feminine. While its various versions and improvised avatars can be used in living rooms and dining spaces to create a more gender-neutral environment, the unmistakable air of femininity in the style comes through in pink nurseries. 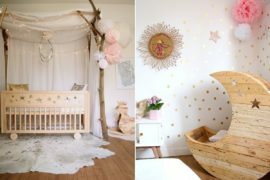 From princess-inspired nurseries in pink and lavender to those in pink and white with rustic and bohemian influences, these gorgeous spaces have a cozy and inviting aura that is simply mesmerizing. A smart compromise between modern and shabby chic styles, these lovely nurseries bring a bit of both without ever seeming ungainly. Clean, straight lines and contemporary décor give the nursery a curated look and also offer more freedom as you shop for cribs and other accessories. A distressed cabinet or a vintage floor lamp along with shades such as pastel and baby pink can give the room a shabby chic vibe without going overboard. 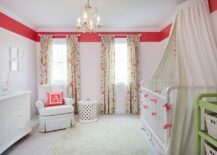 White and pink are natural allies in these comfy shabby chic nurseries, and if you do not want a room that is ‘far too pink’, then opt for an all-white backdrop that is brightened by fab pink accents. Sometimes you cannot define shabby chic exactly, and that is the beauty of the style. Each one of us has our own idea of what constitutes this decorating style. 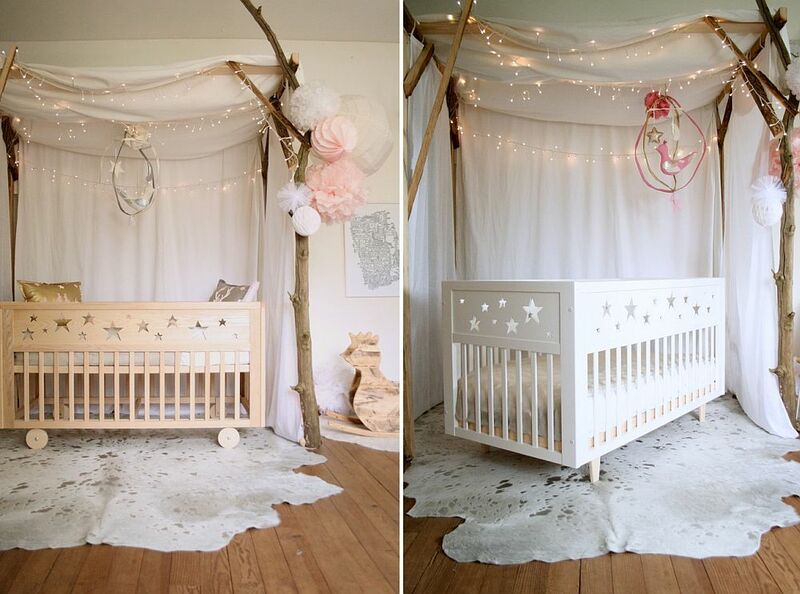 But if we were asked to craft a shabby chic nursery, it would definitely be in line with the room showcased below. 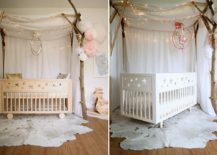 We absolutely adore the use of tree branches to create a canopy of sorts above the crib, and string lighting coupled with pastel pink accessories gives the room a glittering charm. Picture perfect! 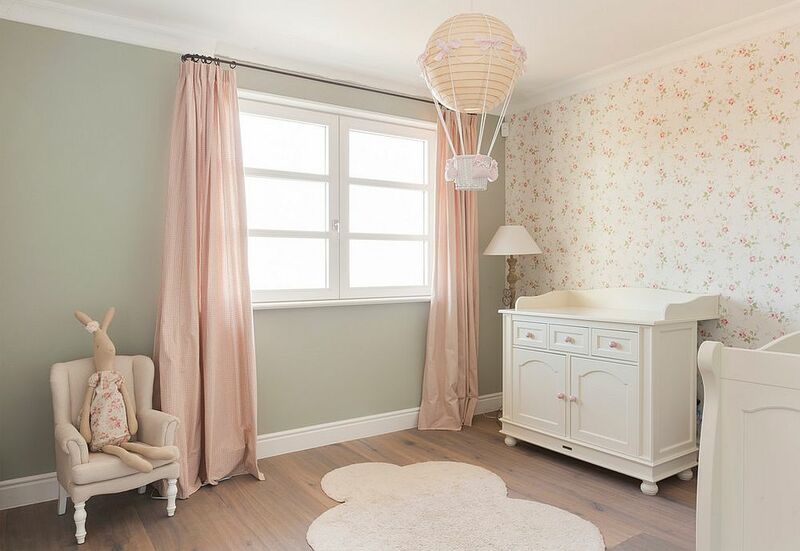 Evenly lit, spacious and with walls that are draped in geometric wallpaper, this nursery combines glamour, shabby chic serenity and midcentury refinement in a brilliant fashion. Colorful pillows on the couch next to the crib and tassels further enhance the shabby chic vibe of the room, even as the room radiates a subtle pink glow. 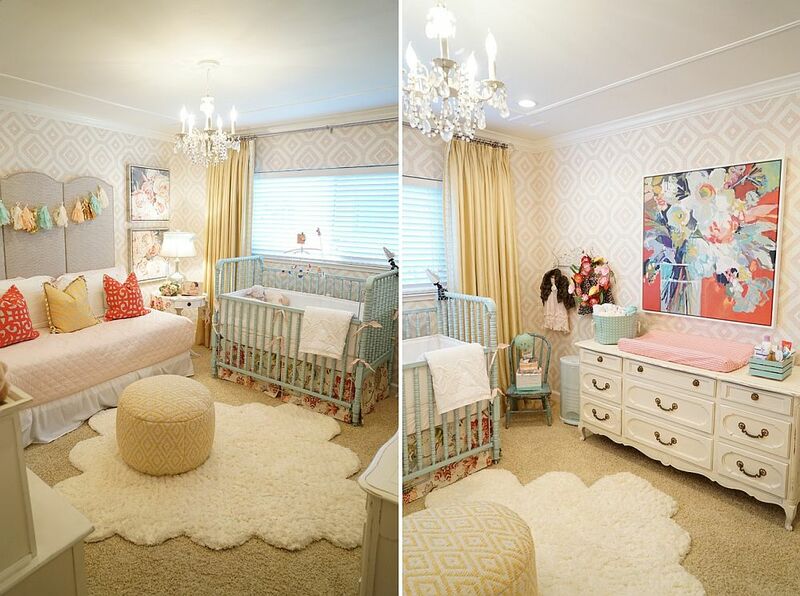 Textured walls seem more Mediterranean than shabby chic, but not in this unique nursery! The backdrop in pink adds texture and has a rustic appeal, even as the mirrored corner cabinet brings brightness to the space. An interesting collage of wooden pieces on the wall and a pink rug complete the inimitable setting. 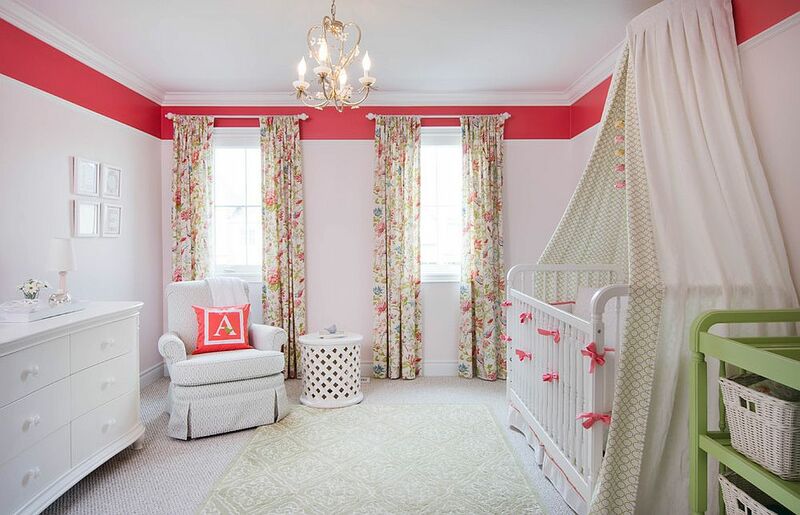 Pink might be the color of choice in shabby chic nurseries, but combining it with other hues definitely gives the room an even more cheerful look. Gray might not really bring this ‘cheerfulness’ to the nursery in pink, but it can anchor the space and give it a sense of sophistication and modernity. Pops of bright yellow, though, can enliven the small shabby chic nursery and give it an instant mood lift. Colors like mint and pastel blue are great for those who do not want to take away from the style and its relaxing appeal. And if you are really in the mood for trying out something bold, then violet, lavender and orange are the perfect hues to experiment with. 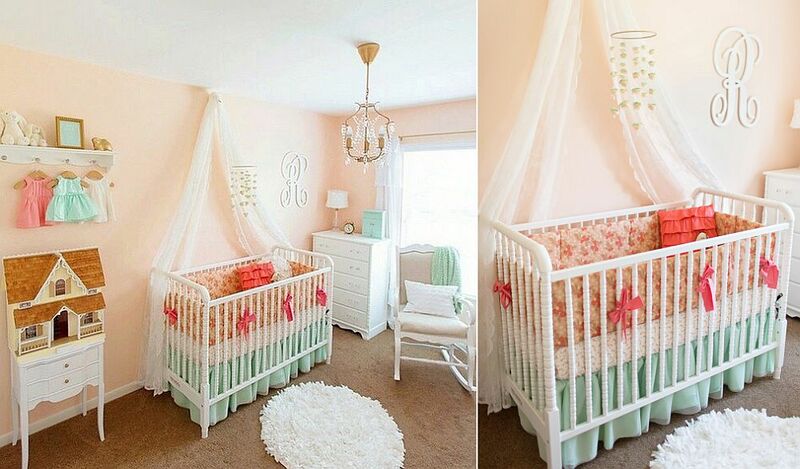 A white and pink shabby chic nursery exudes simplicity and beauty, and feels almost delicate! 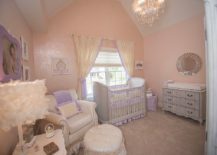 Those searching for a perfect sanctuary for their little princess will not regret opting for this fascinating look.